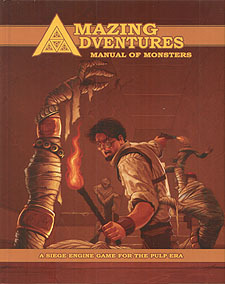 In the Amazing Adventures Manual of Monsters you will find scores of creatures both fantastic and benign, alien and supernatural, to challenge your adventurers. Included herein are over two dozen creatures from beyond the pale that have never before been seen in a SIEGE engine product, and some never seen anywhere else. Also included is advice on roleplaying monsters, handling combat with monsters, creating monsters and more! The ultimate manual of deadly creatures for AMAZING ADVENTURES is here at last!